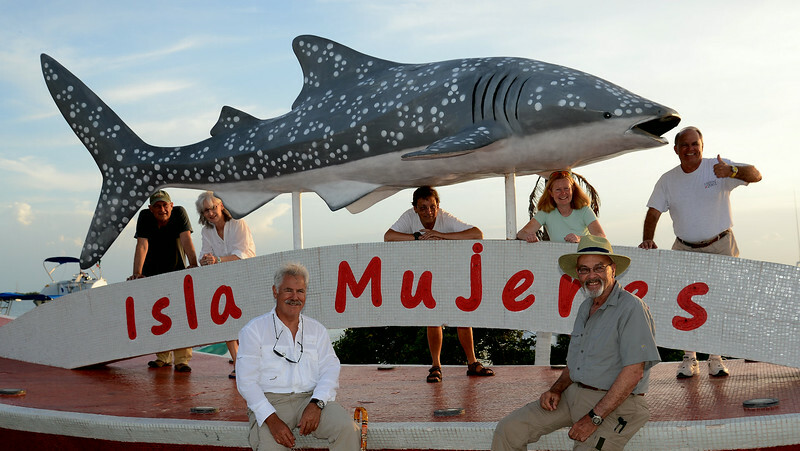 There have been regular whale shark sightings in the western Caribbean for a long time, but for the past 7 years or so the midsummer concentration off the tip of Yucatan has been so consistent that a thriving tourist industry has developed around it. Liz and I met Ken Kurtis, owner of http://www.reefseekers.com/ on our Australia dive trip in 2012, and since he's based in SoCal have subscribed to his online newsletter and seen him on panels at the Long beach Scuba Show. Isla Mujeres is a nice destination. It's touristy, but on a manageable scale with interesting local shops and restaurants. You're ~10 miles across the channel from Cancun, which stretches massively along the beach as far as the eye can see and appears to have several times the hotel/tourism infrastructure of Waikiki for example. Whale shark season is summer, and along with that goes intense heat and humidity. You think you'll jump in the hotel pool to cool off, but no, it's 94F! All the restaurants are open air (that applied to Cozumel too) and are barely tolerable after dark despite the excellent food. During the day, you better be under a fan in a shop or restaurant. Fortunately our hotel air conditioning was as strong as we needed. The weather was actually cooperative for why we were there. There was one tropical squall with lightning around dinner time Thursday night. Otherwise it was mostly sunny and calm. The whale sharks feed on the surface and won't be there if the water is too rough. Monday had some swells and Joe and Mary Jane got seasick on the ride out. The swells were not enough to deter the whale sharks, but there were just a few and I got a real workout chasing them. Liz got seasick from snorkeling on the rolling surface and only went into the water the one time. The boat operator maneuvered to get me close to the whale sharks all 3 times, and I took a few pics, but that was much easier in the calmer and more abundant waters Wednesday and Friday. Usually the whale sharks had remora cleaning fish swimming below them like this. Wednesday was much calmer. Joe and Mary Jane sat this day out so the rest of us got 4x in the water vs,. the standard 3. Here I'm chasing behind a whale shark while our snorkel guide Jair is beside it. Every once in a while you'll get into position as one approaches. Note a second whale shark's tail at upper right. I'm behind the tail in this pic. The larger whale sharks are well over 30 feet. The head is in front of the snorkeler at far left and the tail is beyond the far right. A direct approach from underwater. Later a whale shark surfaced under one of our snorkelers who then slid off his back. Liz had swum over that shark about 30 seconds earlier. Remora by the whale shark's gills. At a distance this picture looks interesting! On Sunday and Thursday we had diving in the channel between Isla Mujeres and Cancun. One was on a wreck but the other 3 were shallow dives over coral heads with lots of reef fish, suitable for snorkelers as well. 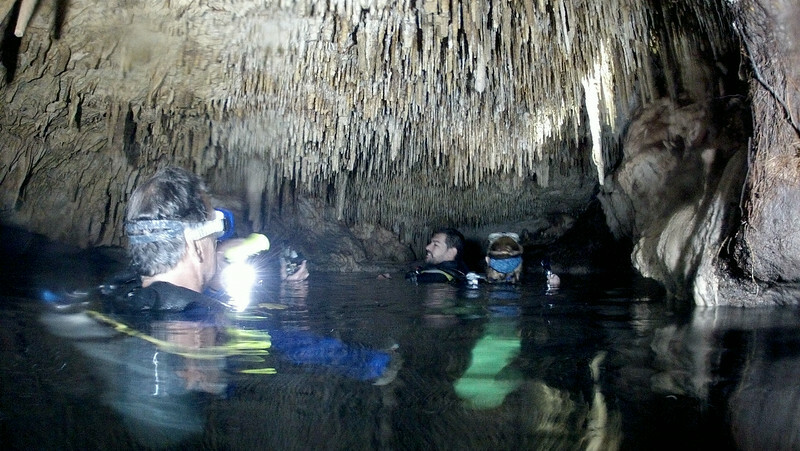 Tuesday we went to the mainland, drove south and dived the Chac Mool Cenotes, which are freshwater caves at about 75F. Liz and I flew to Cozumel Aug. 13 for 3 days of diving there before joining the Reef Seeker trip Aug. 16-23. The southwest side of Cozumel has large coral formations and a strong current that attracts lots of fish. I have never seen so many lobsters in one place. One ledge had 17 lobsters underneath it. The shopping district is quite large because it gets so many cruise ships. There were 3 in port every day we were there even though it's low season in the Caribbean. We stayed in town to be close to the shops and local restaurants. 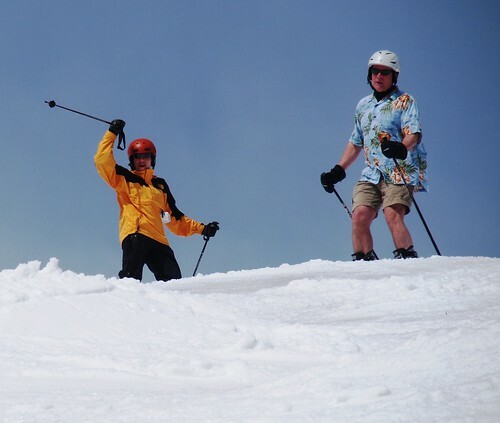 There are several self-contained resorts to the southwest. It has been 9 years since I've been on the Yucatan/Isla Mujeres, but at that time I found the Mayan ruins at Coba and kayaking in the lagoons of the the Sian Ka'an Biosphere Reserve to to be well worth a day trip or more. However, due to the abundance of large crocodiles, when kayaking in Sian Ka'an, it might be best to follow Captain Willard's (Martin Sheen) advice from Apocalypse Now: "Never get out of the boat. Absolutely goddamn right." My first dive trip in November 2004 was with Andrew to Belize. After 4 dive days we went inland to the Jaguar Paw resort, which is on top of a cave system. We went to the Mayan sites at Xanantunich and Cahal Pech. Inland Yucatan tourism in August weather would be pretty tough. You want to be in the water or the air-conditioning as much as possible. Underwater sculpture of "The Bankers" with briefcases and heads in the sand. Beautiful pics, by the way. Especially the cenote shots. 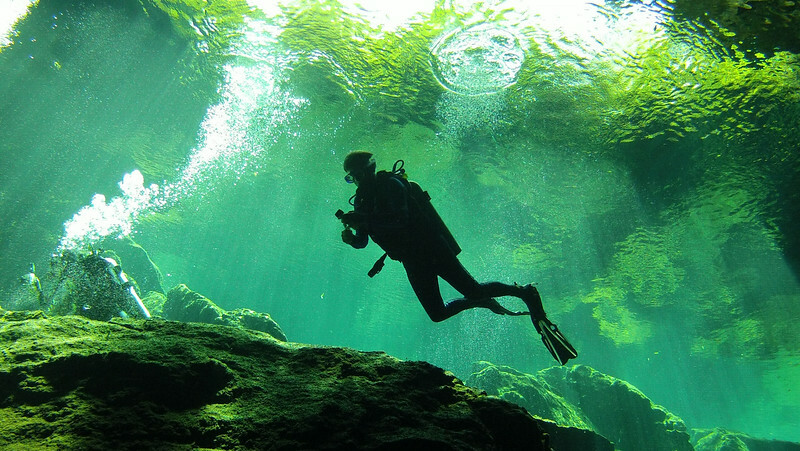 I assume cenote and wreck dives carry significant added risk over open-water dives. Is special certification required? Tony Crocker wrote: Inland Yucatan tourism in August weather would be pretty tough. You want to be in the water or the air-conditioning as much as possible. Our only trip to the Yucatan was in June 2005. Sian Ka'an is just over the dunes from the Caribbean, and benefited from a persistent offshore breeze. Coba was ridiculously hot and humid, but still worth the trip. Its an interesting ruin, because although large, only a fraction has been taken back from the jungle, giving the whole place an Indiana Jones feel. It is worth a trip if you have at least a passing interest in archeology and are ever back in the region during cooler months. For reasons I don't understand, as long as I have some time to acclimate (oddly enough, staying out of airconditioning is key with this for me), I do fairly well with extreme heat or cold. Even so, I was seriously sweaty by the time I reached the top of Coba's largest pyramid. I remember being shocked by the contrast between myself and four local guys also on the top of the pyramid. In t-shirt, shorts and sandals, I was pretty moist. These guys looked more or less immaculate in cowboy boots, pressed jeans, spotless long-sleeved white dress shirts and cowboy hats. I was also impressed by their ability to pretty much skip down the steep and uneven face of the pyramid (which, according to the warning signs averages about a death a year from falls) in their jacked-up, leather-soled cowboy boots while most of the tourists were prudently clinging to a rope railing to climb and descend. There are specialty certificates for cave and wreck diving. The "overhead environment" does require extra attention. 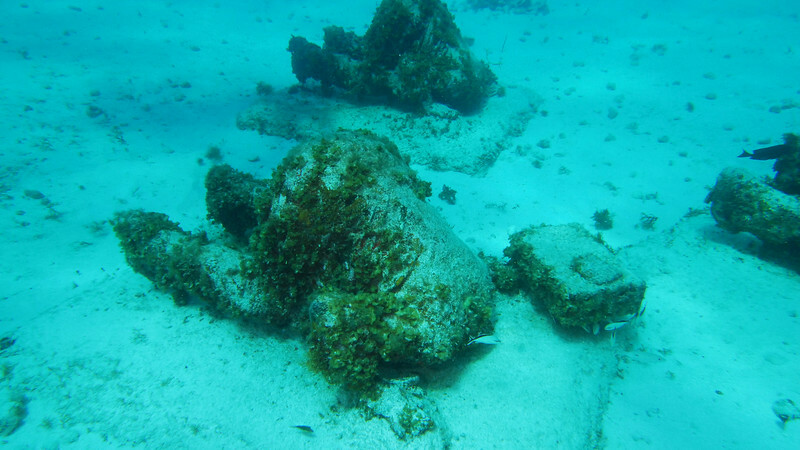 Dive operators are all over the map in terms what they let people do. In Belize in 2004 they let Andrew and me dive the Blue Hole at 130 feet as freshly certified divers, after a couple of days on the local reef at Ambergris Caye. The "letter of the law" is that you're not supposed to go below 60 feet without an advanced certification, but only a few places enforce that. 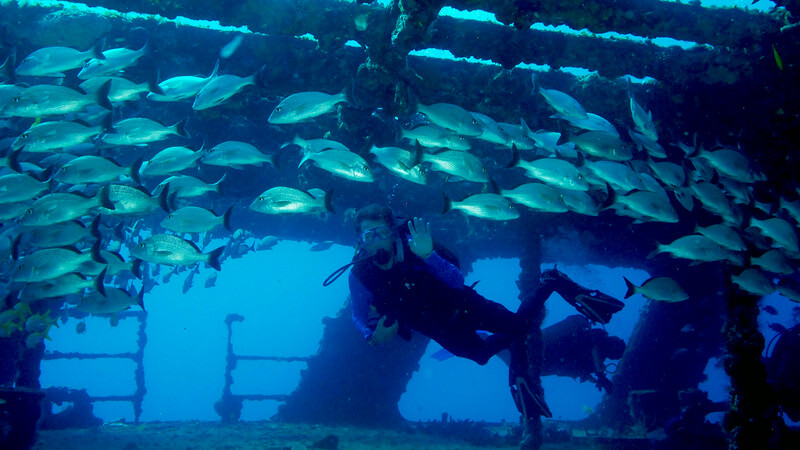 Typically the dive operator observes your diving before taking you to more advanced sites. Ken Kurtis is very safety conscious and is on the panel that analyzes L.A. County diving fatalities every year. Cahal Pech was like that though probably smaller. Xanantunich was quite extensive. Any kind of breeze makes the weather more tolerable. However most resort infrastructure on Cozumel is on the leeward side of the island because that's where the great diving and snorkeling is. Isla Mujeres is a much narrower island, but for whatever reason it seemed even hotter than Cozumel. There was an onshore breeze at the ports/beaches at Cancun and Playa del Carmen. But as soon as you walk inland beyond the first buildings it was just as stifling. I've done a few hot weather hikes like the Wave back in 2012, and I'm OK with that as long as I'm sucking down a lot of water. Of course that's desert heat, and the tropical heat just feels more uncomfortable with the perennially soaked clothing. Al Solish as a former ultramarathoner did inform me that I should be careful about lengthy exercise in sustained heat, that it's very difficult to replace the water/electrolytes etc. fast enough for someone who sweats as profusely as I do. Our time on Isla Mujeres was with a guided tour, so a bit more expensive than it might be on our own. Cozumel was on our own and a very good value: just under $400pp for 3 nights lodging and 3 mornings of 2-tank dives. My friend Roger writes the software for the Remus underwater probe and flies around the world bird-dogging research and defense-oriented projects. He's recently become a film star on Discovery Channel's Shark Week. A plankton-eating shark -- who knew?